The Chief John Ross Chapter, NSDAR and the Charles H. Coolidge Medal of Honor Heritage Center will conduct a wreath ceremony at 3 p.m. on Sunday at the Chattanooga National Cemetery gravesite of Medal of Honor recipient, Ray Duke of Whitwell, Marion County, Tn. Mr. Duke died in service to his nation as a POW during the Korean War on November 11, 1951. 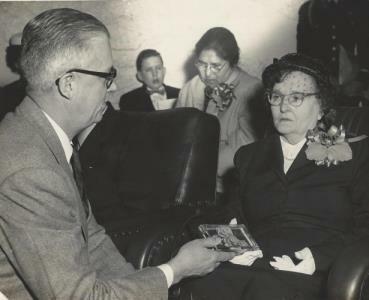 His mother received his Medal of Honor on March 19, 1954. The commemoration will follow the annual Veterans Day Ceremony at 2 p.m. at the Chattanooga National Cemetery. 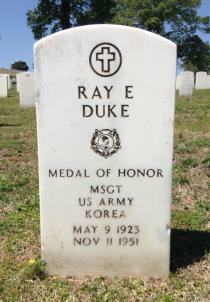 Ray Duke served in the United States Army during the Korean War as a Master Sergeant in Company C, 21st Infantry Regiment, 24th Infantry Division. 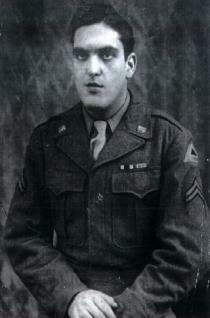 He was awarded the Medal of Honor for his bravery near Mugok, Korea, on April 26, 1951. Master Sergeant Duke’s citation reads, "Duke, a member of Company C, distinguished himself by conspicuous gallantry and outstanding courage above and beyond the call of duty in action against the enemy. Upon learning that several of his men were isolated and heavily engaged in an area yielded by his platoon when ordered to withdraw, he led a small force in a daring assault which recovered the position and the beleaguered men. Another enemy attack in strength resulted in numerous casualties but Sergeant First Class Duke, although wounded by mortar fragments, calmly moved along his platoon line to coordinate fields of fire and to urge his men to hold firm in the bitter encounter. Wounded a second time he received first aid and returned to his position. When the enemy again attacked shortly after dawn, despite his wounds, Mr. Duke repeatedly braved withering fire to insure maximum defense of each position. Threatened with annihilation and with mounting casualties, the platoon was again ordered to withdraw when Mr. Duke was wounded a third time in both legs and was unable to walk. Realizing that he was impeding the progress of two comrades who were carrying him from the hill, he urged them to leave him and seek safety. He was last seen pouring devastating fire into the ranks of the onrushing assailants. The consummate courage, superb leadership, and heroic actions of Sergeant First Class Duke, displayed during intensive action against overwhelming odds, reflect the highest credit upon himself, the infantry, and the U.S. Army". The U. S. government later learned that Mr. Duke had been captured by North Korean troops and confined to a Prisoner of War camp. Refusing to answer questions regarding U.S. troop placements and strength of forces during repeated torture sessions, Mr. Duke was eventually starved to death for his refusal to cooperate. On the 67th anniversary of his death, the general public is encouraged to join in a remembrance of Mr. Duke’s valor and his love of nation.